Pictured (from left) are Natalie McCord, MDS - Columbus District; Ed Mowrer, vice president - distribution operations AEP Ohio; Carl Ransom and retiree Paul West. 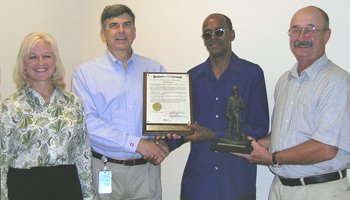 That’s the sentiment AEP Ohio distribution operations retiree Carl Ransom expressed June 17 when presented the Columbus District’s Paul F. West Safety Recognition Award. The Paul F. West Award was established in 2007 to recognize Columbus District employees whose behavior and beliefs best uphold the safety legacy set by the award’s namesake Paul West. A line mechanic A who retired from AEP Ohio in 2007, West worked his entire 35-year career without a recordable accident. West was the first recipient of the award named in his honor. The award was presented during a special recognition breakfast prior to the district’s monthly central safety council meeting.